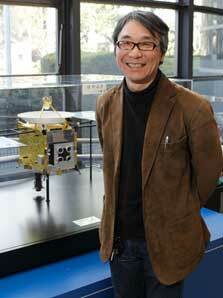 In June 2010, the Japanese asteroid exploration spacecraft Hayabusa returned to Earth after an epic journey into space. In November 2010, it was announced that the spacecraft had succeeded in bringing back samples of sand from Itokawa, an asteroid 300 some million kilometers away from Earth. Hayabusa is the first spacecraft ever to land on and lift off from any celestial body other than the moon and bring back samples. Seven years after its launch in 2003, Hayabusa's six billion kilometer journey, powered by Japan’s leading-edge technology, had come to a successful conclusion. Japan's Ion EnginePerhaps the most notable technology used in Hayabusa is a set of new ion engines jointly developed by the Japan Aerospace Exploration Agency (JAXA) and NEC Corp. Unlike regular rockets, the engine is powered by electricity instead of fuel, giving it excellent mileage efficiency. Combining the ion engines with a large solar battery makes it possible for the probe to undertake missions beyond Mars and Venus. Although the engine has a thrust force of just one gram (the force required to move an object with a mass of one gram), over the course of a year it can reach a speed of up to 2,000 kilometers per hour. By emitting ions rapidly and steadily and accelerating gradually over a prolonged period, the engine makes it possible to carry spacecraft to their destination much more efficiently than a large rocket engine. "Ion engines themselves are not new, but the kind of engine used in Hayabusa is a kind that no other country had ever used before," says its developer, Professor Kuninaka Hitoshi of JAXA. "The most distinctive thing about it is that it doesn't contain any plasma-generating electrodes. In other ion engines, the electrodes wear away. Hayabusa's engine doesn’t have this problem, so it lasts longer—making it ideal for continuous operation over the course of a long-term mission." The durability of the engines used in Hayabusa enabled them to become the most outstanding ion engines ever to be operated for more than ten thousand hours in space. "The original plan was to get to Itokawa and back in four years," Kuninaka explains. "In fact, as a result of a few hitches on the way, it ended up taking seven years. The journey covered a total of six billion kilometers—that would never have been possible without the new engines. "Another feature that makes our ion engines different from those of other countries is that they were programmed with nearly a hundred simulation-based solutions to help them deal with contingencies that might arise. 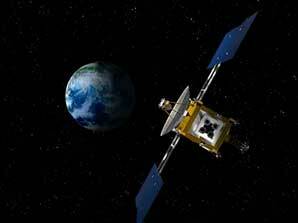 Hayabusa was also equipped with several ion engines, to keep it in operation even if one engine failed. Planetary probes have to withstand an unimaginably tough environment—absolutely anything can happen. The contingency-response patterns programmed into the probe saved the mission from disaster many times." A Showcase of World FirstsAnother Japanese innovation used in Hayabusa is the Autonomous Navigation System. Aiming a probe at a small asteroid like Itokawa is like firing a bullet in Tokyo and trying to hit a five-millimeter mosquito 20,000 kilometers away in Sao Paolo, Brazil. Hayabusa could not afford to deviate even slightly from its scheduled flight path if it was ever going to rendezvous with the asteroid. Moreover, with 300 million kilometers lying between Earth and Itokawa, radio commands would have taken 16 minutes to reach Hayabusa. The probe was therefore equipped with a system that enabled it to think and act independently. 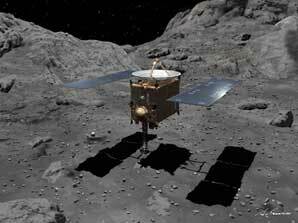 Japan’s advanced robotics technology was vital to the success of the expedition too, using cameras and lasers to monitor the probe's distance from the asteroid, capturing data regarding the terrain, collecting samples, and taking off again. The capsule used to encase the collected particles on the voyage back to Earth was the result of ground-breaking heat-resistant technology. 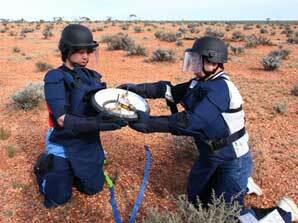 Hayabusa itself was expected to burn up after releasing the capsule prior to re-entry into the Earth's atmosphere. But it was vital that the capsule be strong enough to withstand the searing heat and return safely to earth in one piece. Air temperatures around the capsule as it entered the atmosphere reached around 3,000 degrees Celsius. Once the capsule had made it safely through the re-entry stage, the heat shield dropped off and the capsule containing the samples floated down to Earth on a parachute. The samples were kept in a vacuum to protect them from contamination by the atmosphere. This was the first time in history that planetary samples from space had ever been brought back to Earth.